This study presents selected findings drawn from a larger investigation of Black male students in the community college. In the larger study, qualitative interviews were conducted with 28 Black males attending a public two-year college in the southwestern United States. The focus of the larger study was on identifying factors which, from the perspectives of students, affected their academic success. Academic success referred primarily to students’ grade point averages or achievement and secondarily to continuation towards students’ self-proclaimed collegiate goals. 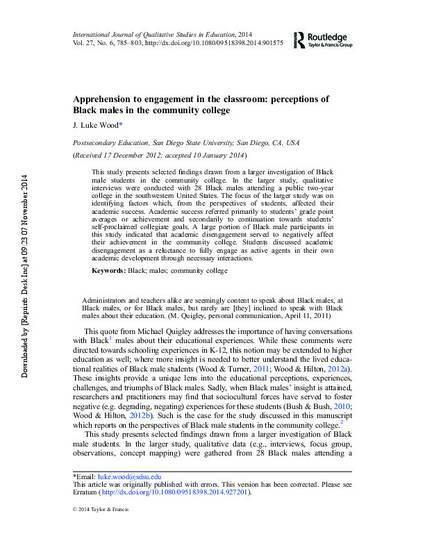 A large portion of Black male participants in this study indicated that academic disengagement served to negatively affect their achievement in the community college. Students discussed academic disengagement as a reluctance to fully engage as active agents in their own academic development through necessary interactions.